i-to-i TEFL is one of the most well known TEFL companies in the world. I just happen to be a former i-to-i student myself having enrolled in their 120-hour course a few years ago. I did this all the while finishing my B.A. Degree at Temple University, working part-time at the Sugar House casino and still found time to have a kick around with my friends on weekdays. This review will help anyone who is ready to pursue a (short or long) teaching career abroad. When I say “ready” I mean you’re nothing less than determined, but just want to hear an opinion before you make a final decision. I know for me personally, it helps when the article is written by a real person and doesn’t have that weird, “we are a company reviewing a company” feel to it. It’s all worded too perfectly and lacks personality. I’m not going to lie to you. I do recommend you take this course because i-to-i is one of the more well recognized TEFL companies around. Just hear me out first and then you can either check out i-to-i or if you’re not convinced get more info from a top-5 TEFL courses review at the end. They understand that most, if not all of the students enrolled have never traveled abroad. I remember the uncertain feeling I had when I was getting ready to buy my plane ticket. If you’ve never traveled or lived in another country on your own then I imagine you may have this feeling. In the words of i-to-i themselves they are the only TEFL provider to have accreditation by both OFQUAL and OLDQC. Ensuring our courses are of a consistently high quality and recognised by schools and employers around the world is central to our values. In fact, we have the only Level 3 TEFL qualification of any TEFL provider. All of i-to-i’s qualifications are regulated by Ofqual. This is important because it lets us know that each course was closely monitored, critiqued and questioned. 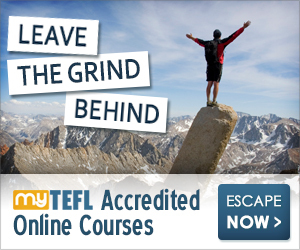 The seal shows your future employers that you have a rock solid foundation on TEFL. Ofqual stands for Office of Qualifications and Examinations Regulations ( ofqual) which has a government department in England. They’re tasked with regulating educational standards. This is why your TEFL will be recognized just about anywhere in the world. This is why a lot of employers know about i-to-i TEFL. If you’re on a budget and wondering, “How the heck can I afford a TEFL course?”. Then check this out right below here. Pursuing any of these courses will only benefit your chances of getting hired. Most employers are looking for a 120-hour TEFL certification, but who’s to say you won’t get hired if you try and go with just a 60-hour course? I’d like to point out that out of all the times I’ve been to Immigration not once was I asked for my TEFL certificate. This was solely a requirement by the employer and yes, they did (my employer) inspect, scan and make copies of it just in case if an immigration officer asked for it. Having a TEFL signifies that you took the time to learn some valuable training for your position. This makes your employer comfortable with you creating and facilitating a healthy classroom environment. How Much Does i-to-i TEFL Cost? This is a big talking point when it comes to these type of adventures. What kind of long-term growth does a TEFL certification offer? It will be good for life. Although, relevant experience should be considered. For example, having experience is always good, but if you stopped teaching for 5 years and decided you wanted to teach again don’t expect to pick up where you left off. This goes for just about any line of work so it wouldn’t be any different for teaching out in Asia. I found this out the hard way when I took a 8 month trip back to the USA. You need a strong network to walk right back into a decent job, especially if you’re a minority. Your education and experience will always play a role in your consideration for a management position. There is definitely room for growth if you’re really serious about making ESL your career. At the end of the day it’s easy to become perplexed choosing a TEFL course. There are a lot of factors to consider, but the most important one is whether or not your employer will accept it. If you’re a native English speaker I’m certain you’ll find a job. Entry-level teaching jobs have a huge turnover rate due to their stepping-stone nature. What I’m saying is the salaries are very low for foreigners. Still you’ll be making more money than most Thai teachers. It’s enough money to take good care of yourself. A family? probably not. So after some experience is acquired most teachers start looking for higher paying jobs in Bangkok. Whether it’s just for the experience or you really want to become a life-long English teacher in Asia. I recommend you you give this course a thorough consideration if you’re serious about teaching English in Asia. Q & A: Did I Ignore Africans as a Whole?